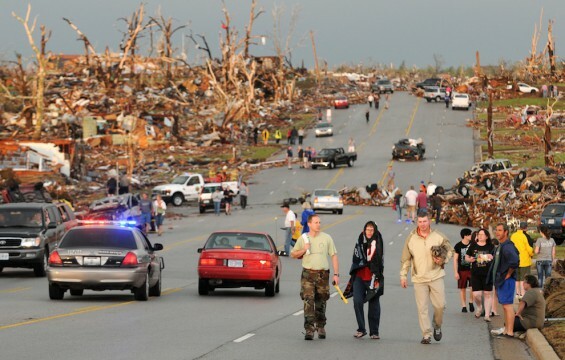 The Joplin tornado on May 22, 2011 killed 158 people in southeast Missouri. 10,000 voter registration cards were returned in Joplin, Missouri recently. The Republican stronghold was ripped apart by a massive tornado last year. Registration cards for more than 10 percent of Jasper County’s approximately 80,000 voters have been returned by the post office, County Clerk Bonnie Earl said Monday. New cards, which must be sent to voters each two years, were mailed out earlier in July. But about 10,000 cards have been sent back because the addresses on them were no longer valid. That’s going to pose a problem for voters — and election officials — at the Aug. 7 primary election, said the clerk. Election officials say many of the cards being returned were sent to residents in Joplin and Duquesne who moved after their homes were damaged or destroyed in the May 22, 2011, tornado but have not yet changed their address with election officials. The process should move quickly for voters who use the new cards, because they include bar codes with voter information stored on iPads that will be used for the first time in the primary election. An election judge will use the iPads to scan the voter card to bring up the voter’s name and address, plus information on the which geographic district the voter is in for legislative and county races.